Tone of voice might not sound like the sexiest of topics, but it’s vital that personal brands get it right. In this episode, we look at how you can add some personality to your writing. 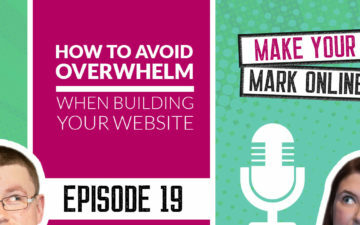 It may be a ‘fluffy’ subject, but we give some actionable tips that you can use straight away for your website content. 1.06 – What is tone of voice? 5.35 – What words describe you? 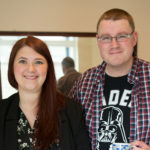 17.05 – Should you write in 3rd or 1st person? Martin: So Lyndsay, tone of voice. Martin: It sounds like it’s one of those marketing things. Lyndsay: Sounds like something I’ve made up. Martin: It does. Yeah. So tone of voice. I mean, we’re talking about websites. We’re talking about SEO. We’re talking about conversions. So we’re talking about tangible stuff. Martin: What is tone of voice, and how does that fit in with everything? Lyndsay: Well that’s a very good question. So yeah. We’re obviously talking about it in a business context. So your tone of voice is essentially your personality. It’s how you come across, and it’s what people hear when they read your words. So if you’ve ever read a novel, or even if you’ve read someone’s website content or email, sometimes you just get a real strong voice in your head of what they sound like. That’s tone of voice, and that’s what, as personal brands, we’re really trying to achieve when we’re writing, through our writing, particularly on our website. But it’s not just obviously on your website that you need to be conscious of your tone of voice. It’s also in emails, on your social media, even on your 404 pages. You need to have that in mind. At all times, you’re communicating with your audience. Martin: Right. So it’s like any words on our website, we need to be thinking about how we are writing. So even if it’s like headlines and stuff like that. That’s what you’re talking about is it? Lyndsay: Yeah. I mean, it’s anything, any communication on your website, so all the copy, all the words on your website, yes. 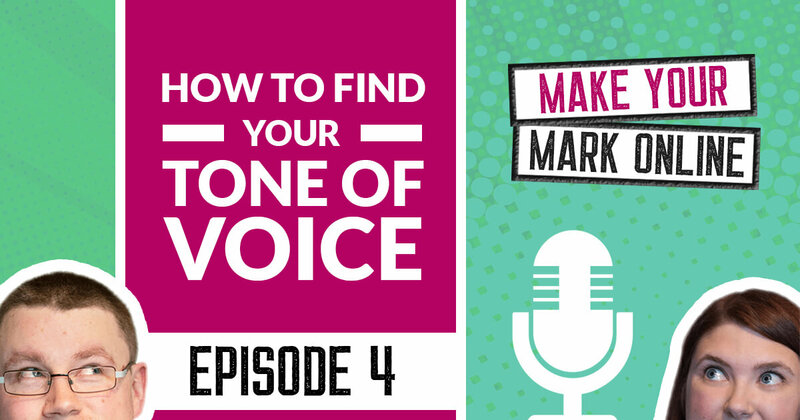 You should be thinking about your tone of voice. Lyndsay: Now, that sounds a little bit scary. But a lot of time, when you start, it does become quite natural. Just as we’re speaking now. You know, you don’t think when you speak how much you sound. It’s not a conscious effort. We need to get to that level when we’re writing really. So yeah. Lyndsay: It will get easier. But it’s worth thinking about it in the beginning. Martin: That makes sense. Well is it really that important? I mean, isn’t it interesting enough for us to have words on our website that tell people what we do or give educational information away. Is it that important, do you think? Lyndsay: I mean yeah, if you wanna be boring. Martin: Okay. Yeah. I see your point. Lyndsay: And I do say this quite a lot. Unfortunately, as personal brands, I do find that tone of voice is probably more important to you guys than it is to maybe other businesses. I think it’s important to every business, but particularly for personal brands. Because tone of voice allows you to be authentic. It allows the reader to really connect with you. And it inspires the reader to take action, all things that we need to do as personal brands. So we really need to have that connection with someone. Martin: Okay. Okay. So, are you saying that it’s like coming across more like a friend or more professional, or what are you actually, what’s the , what are we aiming for? Lyndsay: So that’s a really interesting question actually, and there are different approaches that you can take. But yes. I always think that when you’re looking at your tone of voice, you know, you really want your reader to be able to connect with you as if they’re having a conversation with you in like a café or something like that. They really want that feeling of intimacy. And it’s also about being recognizable as well. So, I mean, in the great words of writing guru [inaudible 00:04:14], if the label fell off your content, would people know it was you? And that’s such a great summary of really tone of voice. Because you want people to recognize who you are. That’s so important to us as personal brands. So I think that’s another great reason why tone of voice is so important. Martin: Okay. So about being relatable, and being authentic, and recognizable. Lyndsay: Yes. We’ve convinced everyone. Martin: We’ve convinced ourselves. And how do you actually find it? Because you’re saying stuff like authentic and things like that. What’s the best way to go about it? Martin: Is it a free online tool. Lyndsay: Yeah. That’s the tricky thing. It is difficult to kind of pinpoint. But the first thing you need to look at is, you can’t find your tone of voice without knowing your brand personality and without knowing who your audience are. So that’s one thing that I would say that you need to know before you think about your tone of voice. Martin: Okay. Okay. So work out who your audience is. So speak to them on their level really. Martin: As if you were in the room with them, you started having a chat, maybe on a call with them. That kind of thing really. Martin: But what about if you’re not sure about what personality you should have? Maybe you start and you have a brand new business, and you wanna write your own content. Maybe you can’t afford to pay somebody else right away. How can you latch into that authenticity really? It sounds so weird. It’s like, how do you teach someone to be authentic? Well, I don’t know. Lyndsay: It’s very, very difficult. But I mean, really, you need to think about firstly, what is your personality? So, as a personal brand, there’s usually a link between our own personal personalities, who we are day to day, and our business. Not always. But generally, I think 90% of the time that there is. Lyndsay: Geeky. Yep. That’s one of ours. Yeah, geeky, and all that I would say is avoid the usual professional and friendly, because well yes. Martin: Yeah. A bit blasé aren’t they? Lyndsay: Think about real words that actually apply to you, and you know, and what you stand for. And I mean, it’s a very, very basic way of really honing in on your brand personality and there’s a lot more in depth that you can do. But that’s a very basic way initially that you can hone in on what kind of personality that you have. Pick three key words that describe you. And that will give you a sense then of what kind of tone of voice to go after. Martin: Okay. So that’s a good tip. That’s a good place for people to start. Do you have any more tools or tips to be able to use along with that one? Lyndsay: Yeah. I think one thing I would say, one caveat to that is that you then have to think about your audience. So what will they respond to? So we had a client recently who said that she was really sweet and bubbly, feminine, girly. And that was great. But her audience was kind of men between 45 and I think it was 64. Lyndsay: And very serious, suit wearing, briefcase carrying type people. It was serious corporate clients that she was after. Now sometimes, that can be a bit of a disconnect there between your personality and the target audience you’re going after. So you need to make sure that it fits. Lyndsay: And generally, you will find that it will fit. I mean, the people that we attract, as Jammy Digital, are people kind of similar to us. Lyndsay: Which is really nice. And you know, they kind of have similar values, and they appreciate similar , you know, kind of respond to our personality quite well. Lyndsay: And vice versa. So just make sure that there isn’t that disconnect there. 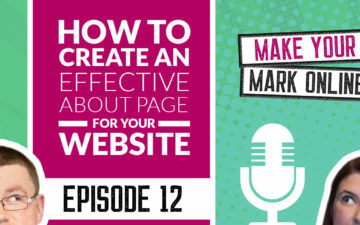 Lyndsay: And another great tip is have your audience in front of you before you start writing. And what I mean is, not actually gather someone off the street and bring them in. That’d be a bit weird. But actually think about your audience. And we have something called a customer avatar, which you may have heard of, which is basically like a summary of who your actual target audience is. But have an idea of who they are. Write that person down. Give them a name. And give them qualities. And actually write that down, and have that in front of you before you start writing. Lyndsay: So before you start writing, you can look at it, and go, “Okay, well I’m actually talking to Sarah now, who’s a mom of three. And she lives in Manchester. And she lives in this house. And these are our problems. And these are things she’s struggling with. And I’m going to talk to her now directly.” And that’s a really helpful way before you start writing to think about how you write to your audience. Martin: Okay. Yeah. That’s a nice one. Anything else you can think of? Lyndsay: So another good tip is to think about how informal or formal you want to be. Now this is kind of a very basic way, but it’s a very easy way to think about how you approach your writing. So when we sit down and write, we automatically think or feel like we’re at school again, don’t we? And we’re like, Dear Sir or Madame. We go extremely formal, even though we’re quite informal in real life situations, maybe when we talk to our clients, when we talk to our customers. We can be quite informal. You know, you actually chat to them on the phone, you can be informal. But as soon as we start writing, I think our backs get up. Lyndsay: We go all stuffy. And I think you need to decide how informal or formal you want to be. I always use this example of an accountancy firm. So you automatically think every accountancy firm must be really formal and professional, and you associate them with them wearing suits and being very serious. Martin: Scare the crap out of you. Lyndsay: Exactly. There’s no need to go really formal. And if your target audience is going to respond to that. I would certainly respond to that. Lyndsay: Much better than some a stuffy language. Then that’s going to appeal to much more to your target audience than being uber professional all of the time. So I think it’s a good idea to decide how formal or informal you want to be from the beginning and tailor your copy around that. But generally, as personal brands, I would say you’re more on the informal side generally. Martin: Yeah. And it’s a great way to differentiate yourself. So if you notice that, if you are a speaking coach, and you teach people how to present on stage, if everybody is wearing a suit, and everybody is saying things like learned the skills to present yourself in the best possible way. And then somebody else just stands out from the crowd and says, “Listen, you wanna speak? You wanna impact the world. You wanna have a successful business? Then let’s jump on a 15-minute Skype call.” You know, I mean that kind of approach is kind of what you’re talking about with the accountant. Lyndsay: Yeah. Absolutely. I mean, if you’re still struggling, think about how you’d actually talk to your target market if you were to give them an email. And so what would you say? What would be the first thing you’d say? Would you say, “Dear Ms. Cambridge?” Would you say, “Hi Lyndsay. Hello Lyndsay. ‘Sup Lyndsay.” Even though no one’s said ‘Sup since 1995. But you know what I mean? Martin: Prince of Bel Air. That counts, doesn’t it? Lyndsay: Yeah. But you know what I mean. How would you actually greet that person? And then you can think about, “Okay, well I’d probably be more on the informal side. I definitely wouldn’t put, “Dear Ms. Cambridge.” So why are you talking like that on your website? And so yeah. You tailor it around that really. But that’s really a basic idea of it. Martin: Okay. Great. Fantastic. So have an opinion as well, I suppose. That’s kind of similar thing. Lyndsay: Yeah. And I mean, having an opinion is a great way to bring out our natural voice. Because when we have strong feelings for something, our natural voice does come out. And it comes out quite strongly. And we always say to personal brands, you have to have an opinion. Don’t sit on the fence and be boring. So if you have an opinion through your writing, then say it. And when you do actually write it, you will find that your natural voice does actually come out. Definitely. Martin: Okay. Anything else you can think of? Lyndsay: Yes. They are amazing. Martin: Check them out. We’ll put the link in the show notes. Lyndsay: Yeah. Definitely. But basically in their course, they talk about branded content. But you can take this more widely too, just any content on your website. Essentially it’s about having words and phrases branded towards you, towards you and your brand. So they are really associated with you. So their example is, they always say, have you got content crickets, which basically mean, you know, is no one looking at your content. Now, the phrase content crickets is essentially their own. No one else uses it, and everyone knows as soon as you hear content crickets, you think Andy and Pete. And people, it’s amazing actually how much people pick this up, and they start saying it themselves. And automatically, you’ve got loads of people actually saying your phrase that you’ve actually made from absolutely nothing. Martin: Yeah. Okay. So that’s a really good point. And we’ll have to really think about doing stuff like that for our business as well. Lyndsay: They are. They’re hilarious. Martin: … a really good thing. Lyndsay: Yeah. Check them out. Martin: And some other peoples or some other businesses manage to really pull the funny thing off. So could we, thinking about tone of voice, could we include a little bit of humour if that’s kind of what relationship we have with our clients? Lyndsay: Absolutely. I think that humour is, it’s one of those key ways that you can, if you feel confident with it, you can actually pull off a really strong tone of voice if you do use humour. So, firstly, you need to decide, okay, do you want to be funny? Is that something that you are naturally? Does it come naturally to you, because there’s nothing worse than forced humour. It’s kind of like David Cameron calling you mate or something. Lyndsay: It just feels wrong. Martin: I think I just threw up a little bit in my mouth. Lyndsay: Yeah. Yeah. And you know, when it’s like, you know, when it’s not suited to you, and it’s awkward, then your audience will feel awkward. So there’s nothing wrong if you don’t want to use humor. Absolutely nothing wrong with that. But just, if you do, just make sure it’s something that actually does come naturally to you, and it’s not, yeah, it’s not an uncomfortable David Cameron calling you mate moment. Martin: Yeah. So it’s about relating your personality, it fits for you, but it also fits with your clients as well. Lyndsay: Yeah. Exactly. Yes. And that’s a really, really good point, Martin. It has to fit with your clients. So I’m naturally very, very dark humoured. Lyndsay: I am. Yeah. And I’m not sure how actually that would, how our audience would respond to that. So I do avoid that really. I don’t have much dark humour in my writing, because I’m not entirely sure how my audience would respond to that. And if you’re not sure, then it’s best to err on the side of caution. But certainly think about the type of humour that you want to use, if you do want to use it. So do you want to be witty? Do you wanna use banter? Do you wanna use slapstick? You know, you can do any type of thing. And a lot of the time, this will just come naturally to you, because this is how you naturally are in real life. You just have to think about it when you’re writing. But just make sure you know that you’re confident that your audience will respond to it quite well. Martin: Okay. That’s a good point. Okay. So I’ve got a question. Might come as a little bit of a curve ball. But should we be writing in first person then, or third person? ‘Cause you see some websites do one way, some websites do it another way. How can we integrate tone of voice within those two options, or do you recommend both? Lyndsay: Yeah. That’s a really interesting question. And I always say write in first person. Martin: It does sound terrible. Lyndsay: ‘Cause they get inside your mind. They understand you a lot more, and they can hear your voice a lot better. Martin: It’s very first person, isn’t it? Martin: Okay. So that’s a really interesting topic actually. I mean, we probably gone on longer than I thought we were gonna go on, ’cause I’m interested in it as well with you being the writer. Any final tips? I mean, is there anything really? I just wanna soak up as much knowledge as we can, and help our listeners out. Lyndsay: Yeah. I mean, I think if you’re still struggling, and it is something that’s hard to wrap your head around initially. If you’re still struggling, then when you have a conversation next with your client or your customer, just, as long as it’s within GDPR rules, hit a record button. Record yourself talking. Because this is something I do. When we come to write web copy for clients, which we sometimes do, I don’t send our clients a, you know, a form to fill in about all services and things like that. I call them up. And then I listen to them get excited about the services that they offer, about the products that they offer. And when you do that, you actually hear your own tone of voice. You hear how authentic you are, how excited you are, what kind of things that you actually say. And you hear yourself. And then that makes it much easier to write. So next time you actually talk to a client, just record yourself, and you’ll be able to then identify your tone of voice, because it’s really, really simple and easy, because you actually do it every day. You just don’t know. It’s just that when we come to write, we kind of stiffen up and forget everything all together. So record yourself. And that’s a really easy way of grasping how you come across to your clients, and how you should come across to your readers on your website. Martin: I think that’s my favorite tip. 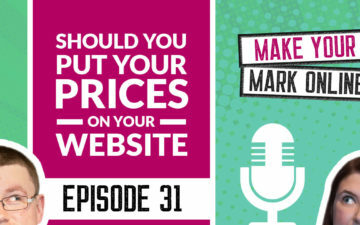 Ep 31 – Should You Put Your Prices on Your Website?